1-2-1 seating in business is indeed getting to be the new standard. 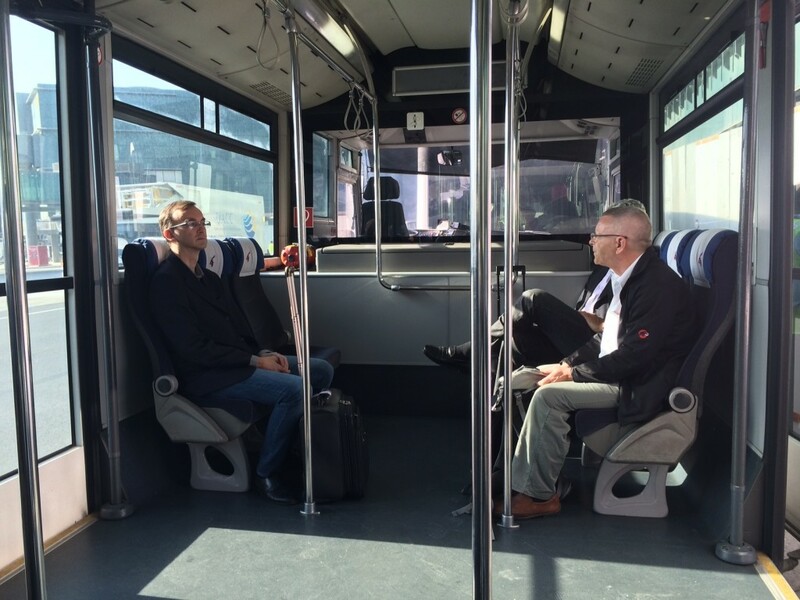 I experienced the new CX business class late last year and it was an excellent product too. It is a pity I like to take only direct flights as much as possible. That means for the time being, BA is my primary airline. But hopefully I can try QR soon at some point. Nice review. 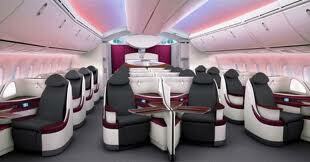 I love Qatar’s Business Class in the Dreamliner. 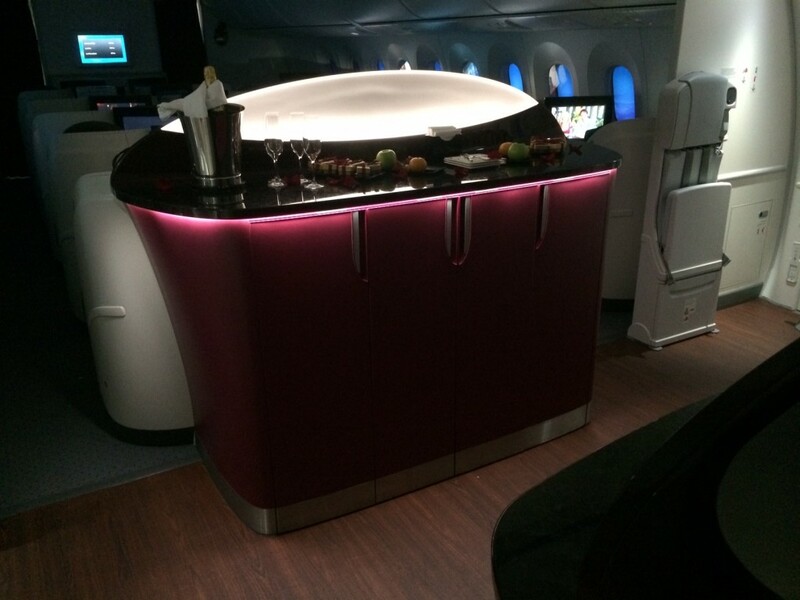 I posted a trip report about it a couple of months ago on my blog, including a Youtube clip: http://theluxurytravelexpert.com/2014/04/15/flight-review-qatar-airways-boeing-787-dreamliner-business-class-bru-doh/. The only thing I did not like was the highly expensive WiFi. I will post my Emirates A380 Business Class experience next week. And I have an Etihad flight in January as well! My Emirates A380 J last week was a bit wobbly, cabin full and crew all over place. Neither my wife nor I got the drink we ordered with lunch and we were being served by different people. Did use the new C concourse at DXB for the first time though. Seat, IFE and food quality still very high. How does their business class product compare to Cathay CX? 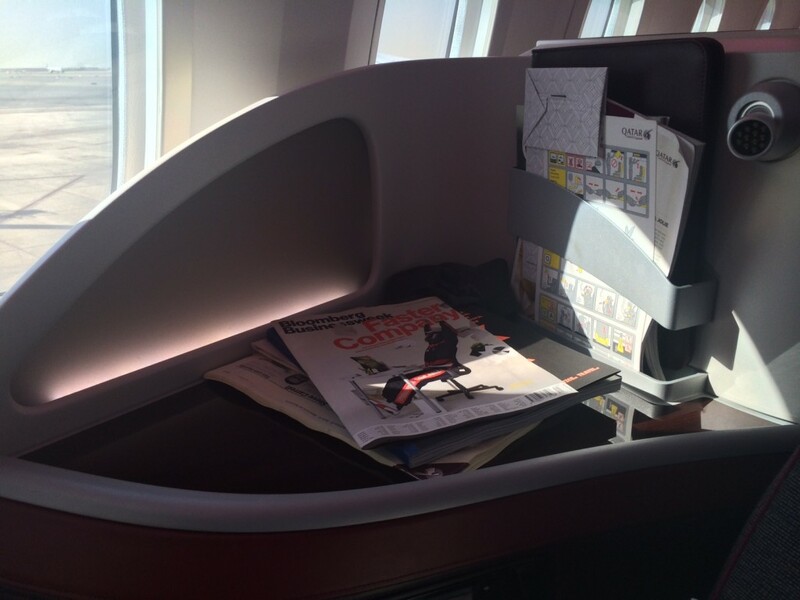 I flew CX recently and was really impressed – not as good as Emirates first class of course but still amazing. 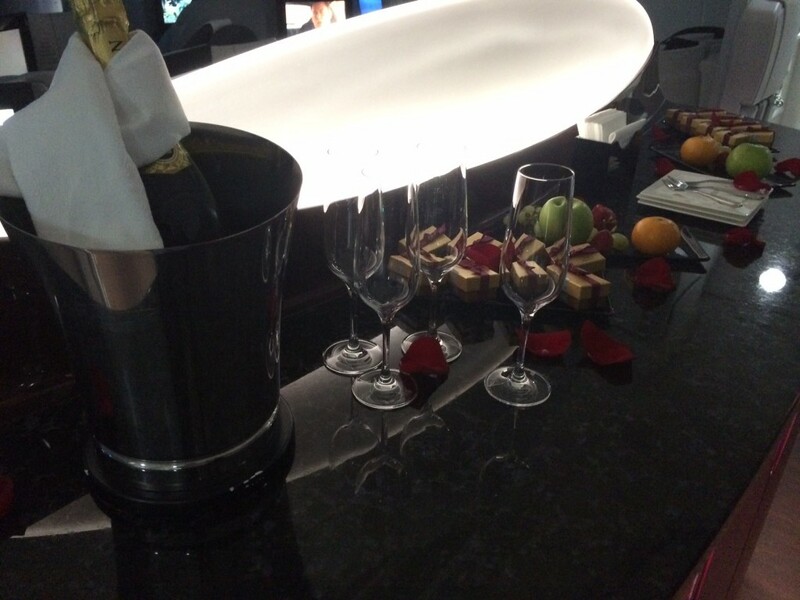 Also what champagne does Qatar serve in business class? I would be flying from Australia to Europe so not sure which planes they have there. Never flown Cathay long haul. Qatar champagne was listed in the 777 review if you go back to that. As for planes, the Qatar website makes it very clear what aircraft you will get – although they do have a habit of switching. I’ve flown QR J, CX J and CX F in the past couple of months, so can give a bit of insight. To be fair, was the “old” CX J on an A340, but I’d say QR are ahead in Business on both the seat and food. Oh, and the 40-year-old port. CX service was more attentive. 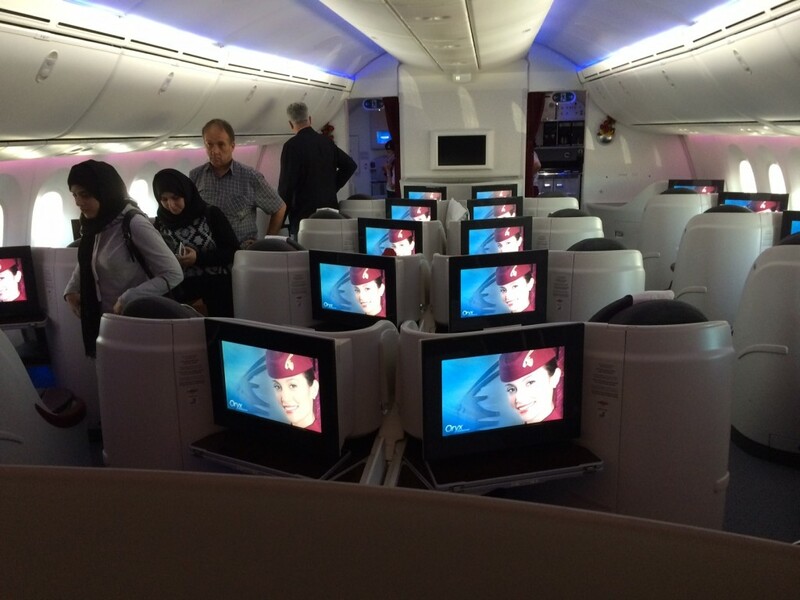 Now CX F on a 777 was a different world entirely. I had a quick peek round the curtain to sneer at the riff-raff in Business, and it did look more spacious than the A340. The Qatar seat looks similar to the CX seat with the 1-2-1 layout, but the CX seat offers a little more privacy with the wraparounds at head height. The CX seat is great. 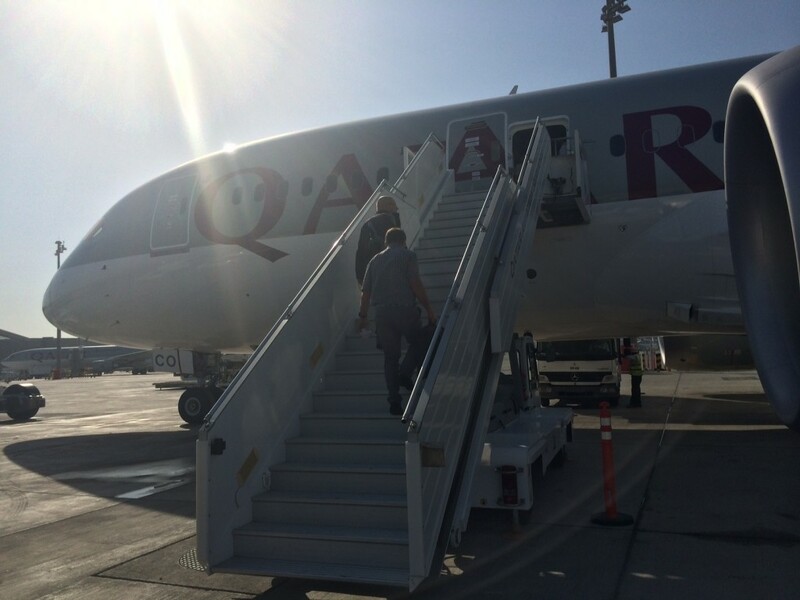 With CX you can be more confident that you will be on their new business class product (on most/all 777-300ERs) for long haul, Qatar operate a mix of business class seats – check back to Raffles review of outward flight to see the difference. 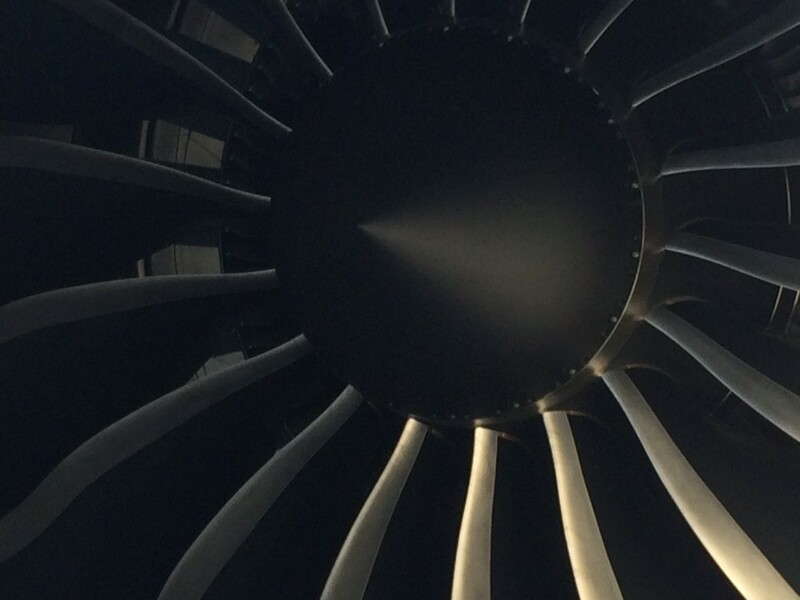 Good review and similar to my experience when I flew Qatar last month for the first time. My first flight was on an A319 (not the all business offering), in your list of aircraft I’m assuming you are only listing those that go to LHR? Quite simply the A319 was superb, a 2 x 2 layout with a fixed 3 rows of business and pretty good recline for a small aircraft. I then went on the A330 back to LHR so one of the older aircraft, the seats were showing their age a little (one wouldnt work if you were sat in it, but would work if you pressed the buttons whilst standing up first) and the TV but on the whole the service is so attentive it doesnt really matter. Food was restaurant quality both ways. Tired their 40 year old port which I hated! On the whole another good flight even if on an older craft. I have this booked from Edinburgh in April for me and the wife. Then onward to Goa. Do you know what they fly to Goa? Usually A321s but can vary between A320/321/330 and even on a few busy occasions A340s. If you do a dummy booking on the Qatar website it will show you what is scheduled. Don’t forget the layover I’m Doha makes a big difference with tier points for BA status. A trip LHR/MAN/EDI-DOH-SIN for example gets you 140×2 BA TP with QR but you get only 160 TP with BA in Cluj world. A return would get you 560 TP, meaning you’re very close to BAEC silver (600 TP and any 4 BA flights which you could easily do as domestic or euro traveller) which includes lounge access, priority boarding, increase baggage, 100% avios bonus when flying BA/IB/AA. I’d gladly change plane In DOH for the TP’s alone, but add their amazing lounge and it’s almost a perfect layover. 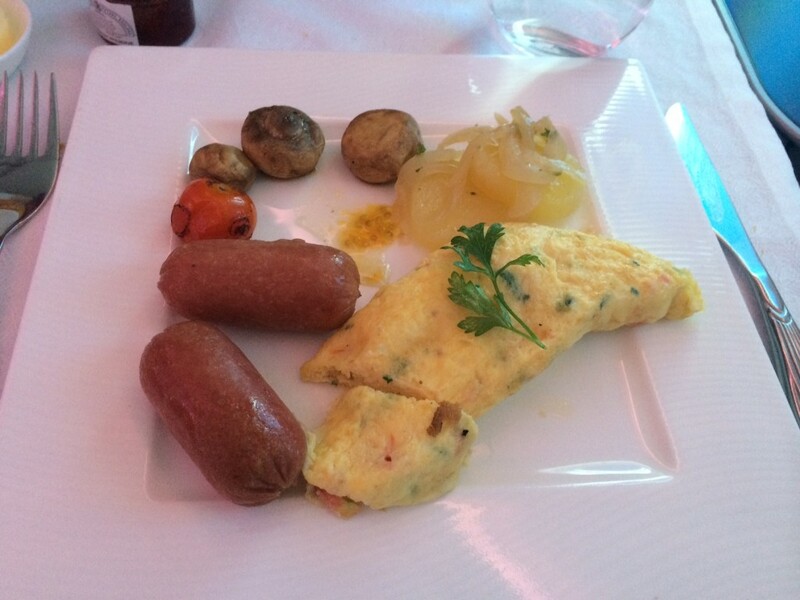 No surprise the food ex-DOH was great – the new catering facility at HIA is the best in the world. Having been apart of the building of HIA, it’s amazing how much more I respect QR with the amount of effort (and money – the catering facility is ~69,000 sq meters and can produce 90k meals a day – it also has a stainless steel roof!!) they put into their food. The Yellow Teddy Bear on the other hand…. not my idea! I am a little over 2m tall and I see these seats differently to a lot of other people. I believe the BE seat to be a Midhaul seat (similar to the BA A321 mid haul seats with a coffin for your legs) that Qatar are using for long haul flights. Qatar’s desire to have the HUGE tv screen likely precluded any way to have it tilt in and out of view (as it does in BA First, Cathay etc) and it robs you of vertical space for your legs and makes the seat feel even more cramped- stopping you crossing them as easily. I don’t understand why the Business one seats in 2:2 on a 321 are no less spacious than the 1:2:1 seats on the B787 and A380 where the cabins are 50% wider – its not like the aisles are 2m wide. The BA First (777 and 380), Club World and all the Sigma Seat users have more overall space for the passenger than the BE seat. The Qatar 777 centre aisle seats are for me the best they have in business; you get a huge amount of space, freedom of movement and all the /benefits/ of the Qatar inflight service. Though if you want the ultimate in business seat the Oman Air 330 seats are unbeatable; even SQ feels cramped after that ride. 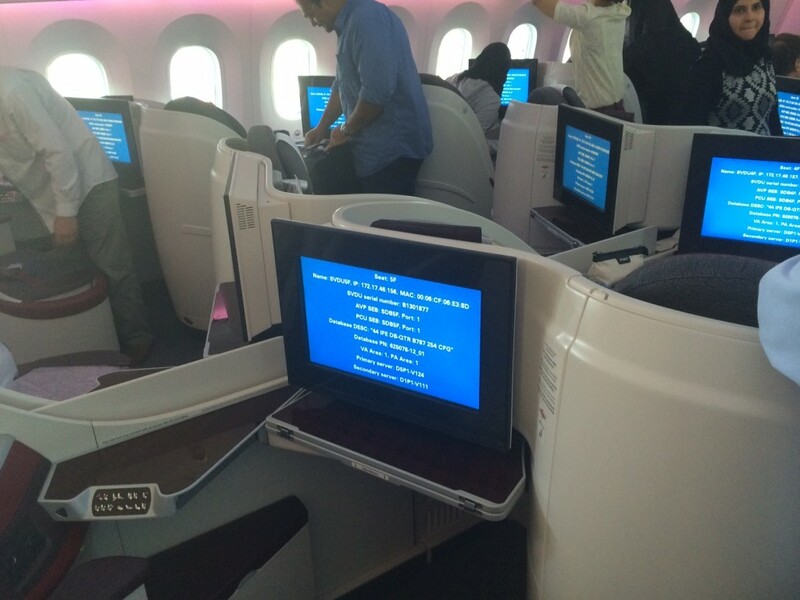 Does anyone know how these seats compare with Eva’s Royal Laurel class ones on the LHR – BKK route? 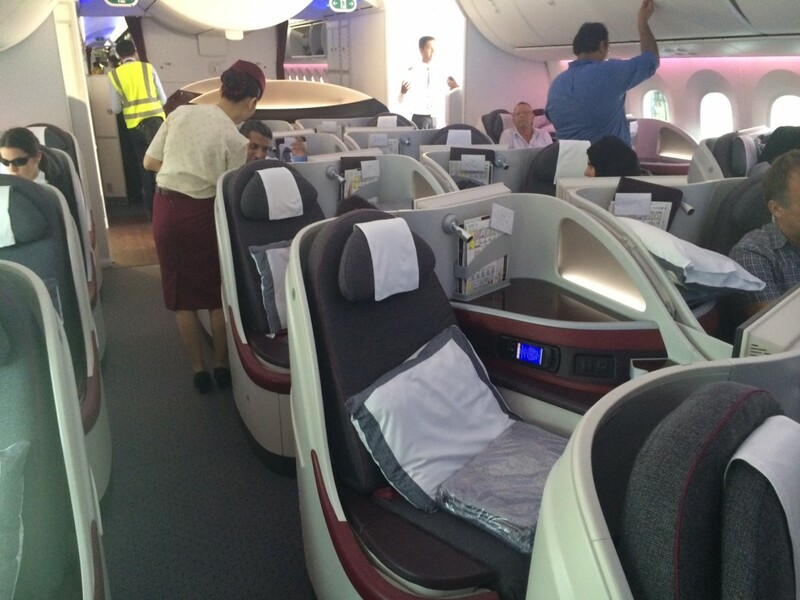 Eva’s new seats are the same as Cathay Pacific and Eva have a direct flight to BKK. Qatar lounges are better in Heathrow; eva’s is better in Bangkok. One is one world and one star alliance if that matters. Seat wise you get more space and legroom; but you get smaller tv screen on Eva and a bit less choice but a bit more space overall. The inboard armrest is VERY narrow if you are larger you might prefer the width of the qatar seat. Service wise qatar is very customer focused onboard in C and Eva’s crew seem a bit more timid, but the food / drink is as good as Qatar and you can book the meals in advance. Just wanted point out that EVA is currently renovating their Lounge at BKK, so Royal Laurel passengers will be using the Thai Airways Royal Silk Lounge instead. I also recommend booking meals in advance with EVA, as you get more choices there. Very useful. Is there an efficient way to use avios from the tax perspective? Yes, tax is substantially lower on Qatar redemptions to Doha vs BA. Also, if you start your Qatar flight in Frankfurt or most other European cities, it is only 25,000 Avios return to Doha in business class as opposed to 40,000 Avios return from London. Tax will also be a lot lower as there will be no APD. My results were that Barcelona has the cheapest tax, but is 40000 avios. A lot of discussion here about current generation business seats. Much of the focus is on their merits as a bed. In my view this is the problem, design that makes for a good bed makes for a bad seat. A good bed requires flat and few component parts wheras a good seat ( for people in common size range at least) requires excellent lumbar support and full range of adjustment. Combining these in a single design is difficult, SQ being a classic example of a weird contraption that fails miserably as both in my view. Many will laugh but my own favourite seat remains Thai old F. As forthe future the way to go I think must be Lufthansas new F but have not yet had the pleasure of trying it and probably never will. For those of is in C though I cannot forsee the perfect seat anytime soon. There is some logic on choosing carriers to maximise seat comfort depending on whether you planto fly overnight or during the day. 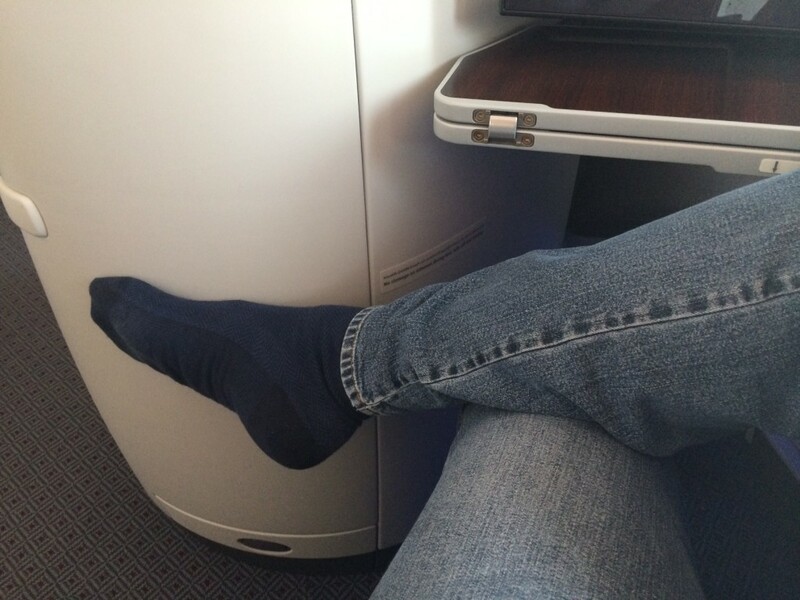 Oman Air might be best best business class for seat/bed I’ve flown. This is a very fair point. 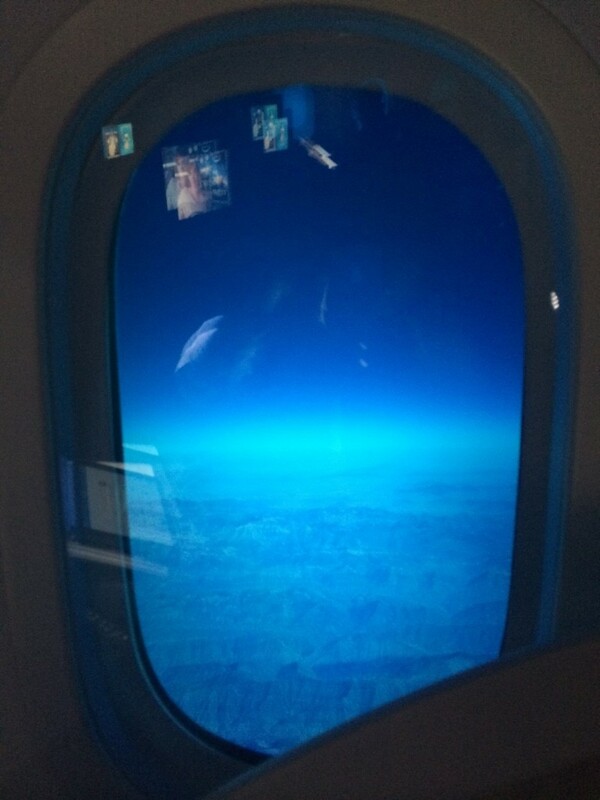 I have done 6 business class long-haul flights in the last month and all have been day flights. Whilst I tend to semi-recline the bed I don’t think I fully reclined it on any of them. I’ve done a couple of trips on the QR 787 recently and I’d pretty much agree with everything you say here Rob, but had one slight niggle – I felt I wanted an armrest on the aisle side of the seat – there is something sort of resembling one there but its far too low to be of any use (but does contain a bottle of water and your headphones!). It needs to be the best part of a foot higher. Other than that I was very happy though. What was the cabin temperature like? No problem. On the outbound 777 flight from Heathrow it was incredibly hot when boarding until the AC kicked in. Excellent review Rob. 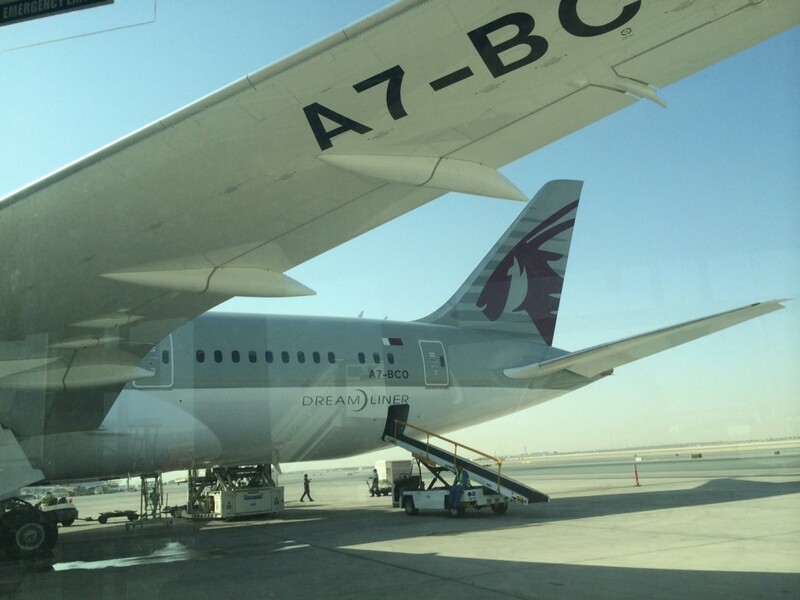 As you know, I flew Qatar LHR-DOH-HKG last New Years eve in economy and I couldn’t fault the food or service. I’d like to try out the business class product sometime.